THE world’s oceans are big, dark and full of mystery. How to unlock the secrets of the deep? With the SeaOrbiter – a gigantic, solar-powered, floating aquatic observation vessel that will scour the seas non-stop for new life and sunken civilisations. It might look like something out of a James Cameron dream but this 190ft tall floating behemoth is taking to open water as the world’s first non-stop exploration vessel, complete with submarine drones, underwater living quarters and space training simulator. 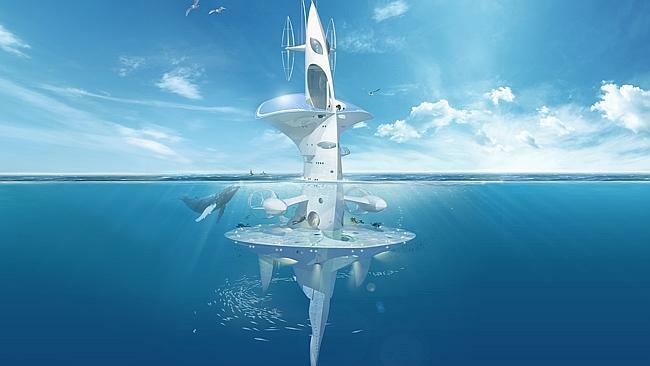 Oceanographer Jacques Rougerie is the mastermind behind the SeaOrbiter – a creation he’s been designing for over a decade – and secured the final 30 per cent of the A$53 million build cost from crowdfunding site KissKissBankBank. 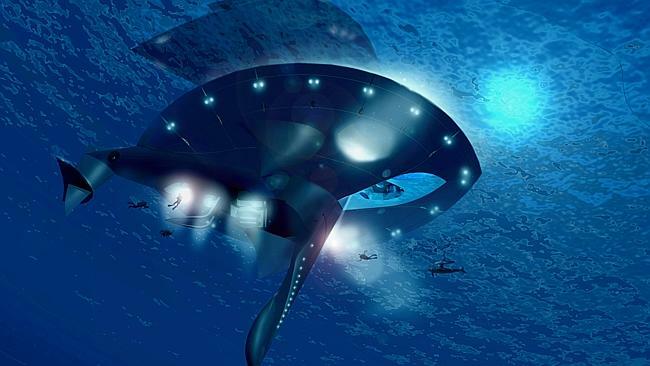 Constantly roaming the oceans and with over half of the 190ft ship under the water’s surface the SeaOrbiter offers an alternative exploration proposition to current research projects. Missions have been mapped out when it sets sail to get an in-depth look at seabeds, search for lost civilisations, find mythical deep sea creatures and find new life forms. With 90 per cent of the world’s oceans still unexplored it’s estimated that there are millions more species not yet recorded or observed and Rougerie aims to scan the planet’s abysses to find them. So if you’re going to discover new forms of life, why not do it in style. This mega craft looks to blow all other research vessels out the water being decked out in some high-tech tech kit including being built from Sealium – a recyclable aluminium designed for marine environments – and powered through a ‘solar skin’ which will let it sail in silence. On-board there’s a hive of high-tech devices from which large numbers of subsea exploration devices leave daily like sub-aquatic bees to gather data and return at the end of each trip. 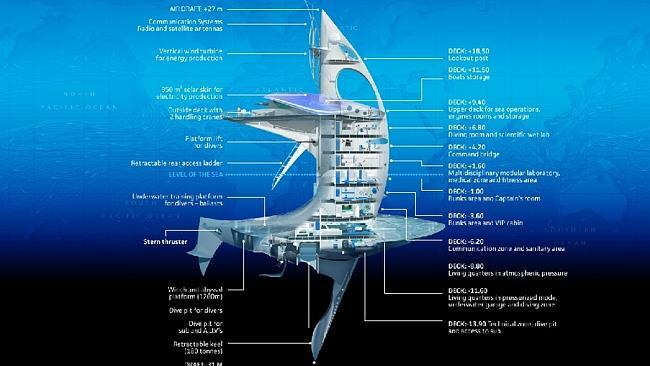 With ten accommodation levels there is room for 22 permanent inhabitants, including four above the water for sea bird and surface observation and six decks below the water that will let residents continuously peek out into the big blue. Pressurised hyperbaric quarters are also found below, which are intended to save deep sea divers the bother of having to go through the decompression process. Work will begin later this year and when fully operational it will spend its time scanning the Mediterranean. There are plans to eventually have a fleet of floating SeaOrbiters. Watch out Nessie! • Hyperbaric laboratory to carry out unrestricted dives at depths of between 10m and 100m without the inconvenience of decompression stops. Aquanauts stay in a pressurised chamber which keeps them at the same pressure as the surrounding underwater environment. They can then stay on extended dives among the marine creatures, especially during the night, a critical period when unknown animals rise to the surface from the deep.